Des Moines, IA – The Iowa Barnstormers (9-2) extended their winning streak to seven consecutive games with a 56-54 win over the Cedar Rapids Titans Saturday night at the Wells Fargo Arena. The Barnstormers started the game off throwing an interception on its first offensive drive. Cedar Rapids capitalized by scoring on its first offensive play. Iowa redeemed itself when quarterback Travis Partridge found receiver Ryan Balentine for a three yard touchdown, 7-6. On the next Titan possession, Iowa defensive back Bryce Enyard intercepted Cedar Rapids quarterback Brion Carnes and took it back to the three yard line where Partridge then called on receiver Lucas Hefty for a three yard touchdown, 14-6. Starting the second quarter, the Iowa defense forced another Cedar Rapids turnover when defensive back DaeJohn Love recovered a fumble. Next, Carnes connected with receivers Tre’ Parmalee for his second touchdown reception and Connor Hollenbeck for a score, 22-14. Iowa answered when Partridge found Balentine for the second time in the half, 22-21. Carnes called on Hollenbeck again before the end of the first half, 28-21. In the second half, Iowa switched to the ground game as Partridge ran in a two yard touchdown, 28-28. Carnes threw his fifth touchdown pass of the game when he connected with receiver Damond Powell for a 25 yard score, 36-28. Iowa took the lead when Partridge found receiver Brady Roland for an 11 yard touchdown and then a 20 yard score, 42-36. Carnes stuck to the air and connected with Parmalee for his second touchdown reception, 42-42. On the next Barnstormer drive, Partridge called his own number and scored a one yard touchdown run, 49-42. Carnes found Powell for a 42 yard touchdown strike, 49-48. With under 40 seconds in the game, corner Dee Maggitt Jr. picked off Carnes and took it back for a pick six, 56-48. Carnes threw his eighth touchdown of the game when he found Parmalee for a 32 yard pass with 18 seconds left in the game, 56-54. The Barnstormers return to Wells Fargo Arena on Friday, May 26 as they face division rival the Green Bay Blizzard. 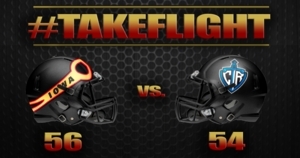 Kickoff is scheduled for 7:05 p.m. Tickets to the game are available by calling the Iowa Barnstormers front office 515-633-2255 or visiting www.theiowabarnstormers.com.